The Mill City Community is diverse, and so are the families that we all come from. As we think about going home for Thanksgiving, many of us feel nervous or anxious about sitting around the table with people we love but may deeply disagree with. How can we, as Christ-followers, navigate the muddy waters in the wake of such a divisive political season? 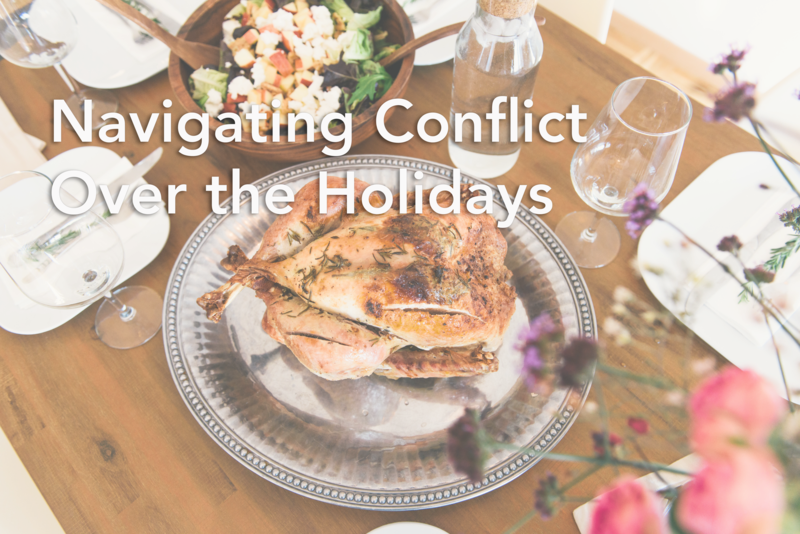 How can we calm our hearts and minds as we gather with family that might fall on opposite ends of the political, spiritual, or emotional spectrum? This fall we’ve been journeying through a sermon series about “Going Public.” We’ve explored all the ways Jesus engaged in public spaces and political tension: by inviting, advocating, storytelling, confronting, being different, extending grace, sharing good news, lamenting, and giving thanks. These sermons are rich with application for navigating family political or relational tension this season, and we’d encourage you to re-listen to a sermon that grabs your attention, but we also want to offer three simple practices you can try this season that can help cultivate a thankful and courageous heart. 1 // Pray before entering the room. Take some time to pray on the car ride there or before even leaving your home. This may seem simple, but there is deep power in praying for our enemies. We may not see our uncle or our mom who disagrees with us as an “enemy,” but we may feel that way in the most tense or harsh of conversations. Pray for them by name. “Help me to see __(so and so)__ through Your eyes; help me see them made in the image of God.” “Holy Spirit, would You go before me/us and create an atmosphere of listening and understanding?” The Holy Spirit is the great counselor. Sometimes we see it as our job to convince whoever we are speaking with of the “truth.” We think that if we don’t say anything, then no one will. Trust that as you are playing your part, sometimes what we can say or do feels limited, and it is! Trust in God, as it is ultimately God’s role to change hearts. 2 // Picture Jesus in the room. God is with us. He cares for people on both sides of the spectrum and everywhere in between. And sometimes the anxiety of these conversations, or even just being around people of different beliefs than you, feels overwhelming. PICTURE JESUS IN THE ROOM. This is a form of imaginative prayer. Imagine Him with you. What is He saying to you? How does His presence bring compassion? How is He fighting for truth, for the oppressed, when your words cannot? How might He be comforting? How might He be confronting? Whether you do this in the moment or perhaps in a quiet moment through journaling or discussion with a trusted friend, this can be a powerful tool to remember that Jesus is with us. 3 // Practice the use of “I” Statements. Nothing escalates a disagreement more than statements that blame others, or accusatory statements that include the words, “You really believe...” In any disagreement, using I statements, like “I feel” or “I think,” creates space for empathy not just for those in the room but populations we feel like we may want to advocate for. Want some more resources? Check out this post on peace-making, or take a look at the Mill City Community's commitment to peace-making.